In June, CNN was the only cable news network to grow in M-F primetime vs. last month in the key demo adults 25-54. In M-F primetime, CNN grew an impressive +43% (220k vs 154k), while FNC was flat (597k vs. 600k) and MSNBC lost -4% (247k vs. 256k) of its audience. At 10p, AC 360 was the only program during that time period to grow double digits, increasing 23% in the key demo 25-54 (254k vs. 206k), FNC’s On the Record was up 9% (503k vs. 462k) and MSNBC was up 8% (213k vs. 198k). Also compared to May, Larry King Live was the only cable news program at 9p to increase double digits, growing +28% (213k vs. 166k), while FNC’s Hannity grew only 10% (572k vs. 520k) and MSNBC’s Rachel Maddow was flat (248k vs. 248k). In June, CNN topped MSNBC in total day among total viewers by 12% (458k vs. 410k) and by 5% in the key demo 25-54 (157k vs. 149k). During the daytime (M-F 9am-5pm) in head-to-head comparisons with MSNBC’s non-opinion news programming – CNN posted a +72% advantage in total viewers (530k vs. 309k) and had a 72% advantage among 25-54 viewers (150k vs. 87k). MSNBC placed fourth every hour of the day in the demo 25-54, except at 3p where they placed third behind Rick’s List. The Situation Room with Wolf Blitzer at both 5p and 6p is having its second best month this year, behind only the Haiti-driven month of January 2010. At 5p, The Situation Room topped Hardball in both total viewers (635k vs 550k) and in the key demo 25-54 (183k vs. 121k) and at 6p it outperformed MSNBC’s The Ed Show in the key demo (172k vs. 155k). Of note: Data comparisons to year ago include the death of Michael Jackson (June 25, 2009) and the heavy viewing days that immediately followed in the Nielsen reporting period (ending June 28, 2009). Since BP’s oil rig exploded in the Gulf of Mexico nearly 10 weeks ago, CNN is the only cable news network to register growth vs. the previous 10 weeks among adults 25-54, up 15%. Meanwhile, FNC registered a 11% decline among P25-54, and MSNBC dropped 9%. Additionally, Anderson Cooper 360 increased 20% among 25-54 viewers, the only gain of any cable news network at 10p during the past 10 weeks. Morning Express with Robin Meade continues to top MSNBC’s Morning Joe in the second quarter among 25-54 viewers (177k vs. 117k). 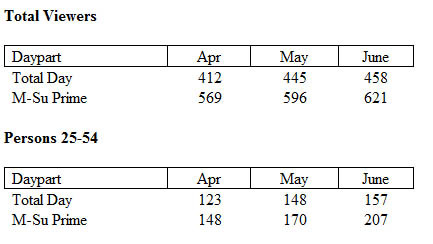 June 2010 marks the 15th consecutive month that Morning Express has beaten MSNBC’s Morning Joe in the 25-54 demo. The Joy Behar Show has the most growth of any primetime show in Q2 among total viewers (up 39%). The Joy Behar Show also had the most growth among total viewers in June in primetime (up 52%) and the most growth at 9p among 25-54 viewers (up 23%). * On MSNBC, Countdown declined -22% among 25-54 viewers in June while Rachel Maddow declined -15% among 25-54 viewers for the month. * FNC is down double digits in both total day and M-Su Prime compared to last quarter—down -19% and -21% respectively. * June 2010 also marked the lowest P25-54 delivery for Glenn Beck so far this year, down 32% from his peak in January. Additionally, Hannity is down 28% among 25-54 viewers since January. In May, CNN Digital ranked No. 1 among ALL Current Events and Global News sites in several key metrics, beating properties such as MSNBC Digital, Yahoo! News and Fox News Digital. * No. 1 in Time Per Person: 22.7 minutes, the highest time spent among the top 20 News and Information sites. This entry was posted on June 29, 2010 at 1:14 pm and is filed under Ratings Related. You can follow any responses to this entry through the RSS 2.0 feed. You can leave a response, or trackback from your own site. This report paints a rosy picture for CNN that doesn’t seem to agree with a different one that claims FNC is top among total viewers and the A25-54. I assume this is all spin. Am I missing something? It’s summertime. Fox always has 2 to 3 times the views as Pravda America (CNN and MSNBC) has, except in the summer, when normal people are enjoying the outdoors (except in the evenings (like me).